The world almost conquered famine. Until the 1980s, this scourge killed ten million people every decade, but by early 2000s mass starvation had all-but-disappeared. Today, famines are resurgent, driven by war, blockade, hostility to humanitarian principles, and a volatile global economy. In Mass Starvation, world-renowned expert on humanitarian crisis and response Alex de Waal, provides an authoritative history of modern famines: their causes, dimensions, and why they ended. He analyzes starvation as a crime, and breaks new ground in examining forced starvation as an instrument of genocide and war. Refuting the enduring but erroneous view that attributes famine to overpopulation and natural disaster, he shows how political decision or political failing is an essential element in every famine, while the spread of democracy and human rights, and the ending of wars, were major factors in the near-ending of this devastating phenomenon. 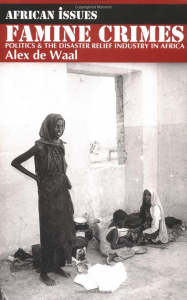 Alex de Waal’s latest book (Polity Press, September 2015) draws on his thirty-year career in Sudan, Ethiopia, Eritrea and Somalia, including experience as a participant in high-level peace talks, to provide a unique and compelling account of how these countries leaders run their governments, conduct their business, fight their wars and, occasionally, make peace. De Waal shows how leaders operate on a business model, securing funds for their political budgets which they use to rent the provisional allegiances of army officers, militia commanders, tribal chiefs and party officials at the going rate. This political marketplace is eroding the institutions of government and reversing statebuilding and it is fueled in large part by oil exports, aid funds and western military assistance for counter-terrorism and peacekeeping. 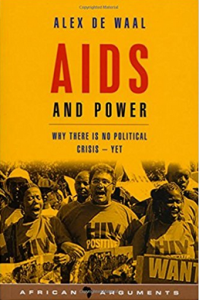 Part of a series on burning issues confronting Africa and the world, this book talks about AIDS in Africa - what it means for government and democracy. It argues that approaches to the epidemic are driven by interests and frameworks that fail to engage with African resilience and creativity. 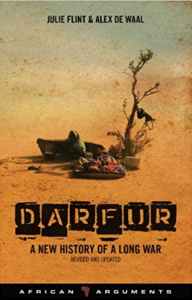 In 2004, Darfur, Sudan was described as the "world's greatest humanitarian crisis." 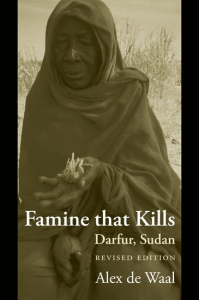 Twenty years previously, Darfur was also the site of a disastrous famine. Famine that Kills is a seminal account of that famine, and a social history of the region. In a new preface prepared for this revised edition, Alex de Waal analyzes the roots of the current conflict in land disputes, social disruption and impoverishment. Despite vast changes in the nature of famines and in the capacity of response, de Waal's original challenge to humanitarian theory and practice including a focus on the survival strategies of rural people has never been more relevant. Documenting the resilience of the people who suffered, it explains why many fewer died than had been predicted by outsiders. It is also a pathbreaking study of the causes of famine deaths, showing how outbreaks of infectious disease killed more people than starvation. Now a classic in the field, Famine that Kills provides critical background and lessons of past intervention for a region that finds itself in another moment of humanitarian tragedy. 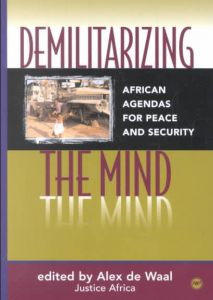 This book highlights a central, but neglected component of Africa’s complicated and intractable wars: the militarization of governance. Political cultures of militarism stand in the way of enduring peace, democracy, and the development of civil society. Militarism comes in both right-wing and left-wing guises—the latter practiced by former liberation fronts in power across much of Africa which have all betrayed the ideals that enthused their earlier struggles. Seven comparative essays, drawn from the experience of conflict and peacemaking, focus on different aspects of militarism in contemporary Africa and ways of overcoming it. Famine is preventable. The persistence of famine reflects political failings by African governments, western donors and international relief agencies. Can Africa avoid famine? When freedom from famine is a basic right or a political imperative, famine is prevented. Case studies from Ethiopia to Botswana demonstrate African successes - but they are often not acknowledged or repeated. Who is responsible for the failures? African generals and politicians are the prime culprits for creating famines in Sudan, Somalia and Zaire, but western donors abet their authoritarianism, partly through imposing structural adjustment programmes. What is the role of International relief agencies? Despite prodigious expenditure and high public profile, relief agencies often do more harm than good. From Biafra to Rwanda, relief has helped to fuel war and undermine democratic accountability. As the influence and resources of UN agencies and NGOs have grown, the chances for effective local solutions have diminished. What is the way forward? Humanitarian intervention and other high-profile relief operations have failed. Progress lies in bringing the fight against famine into democratic politics, and calling to account those guilty of creating famine. de Waal, Alex . ‘Inclusion in Peacemaking: From Moral Claim to Political Fact,’ in Pamela Aall and Chester Crocker (eds.) The Fabric of Peace in Africa, Looking beyond the state, Waterloo ON, Centre for International Governance Innovation, 2017. “African Union High-Level Panel on Darfur, Darfur: The Quest for Peace, Justice and Reconciliation,” (October 2009). Dr. Alex de Waal, principal author on the drafting team. With Jennifer F. Klot, Manjari Mahajan, & Dana Huber, “AIDS, Security and Conflict: New Realities, New Responses,” AIDS, Security and Conflict Initiative, Social Science Research Council (SSRC)(Sept. 2009). Dr. Alex de Waal was the principal investigator and lead writer. “Joint Learning Initiative on Children and HIV/AIDS, Home Truths: Facing the Facts on Children, AIDS, and Poverty (Feb. 2009). Dr. Alex de Waal was a lead member of the drafting team. “Commission on HIV/AIDS and Governance in Africa, Securing our Future,” the Report of the Commission on HIV/AIDS and Governance in Africa (June 2008). Having been the originator of CHGA, Dr. Alex de Waal was asked to edit the final report and to write the chapter on governance. “HIV/AIDS: Africa’s Greatest Leadership Challenge” (Dec. 2000). This is the report of the African Development Forum 2000 for which Dr. Alex de Waal was the lead writer. “Food and Power in Sudan: A Critique of Humanitarianism,” African Rights (1997). Dr. Alex de Waal was the principal investigator. “Facing Genocide: The Nuba of Sudan, African Rights” (1995). Based on the first outside visit to the non-government held areas of the Nuba Mountains, Dr. Alex de Waal was the writer of this report. “Rwanda: Death, Despair and Defiance,” African Rights (1994). While Rakiya Omaar was in Rwanda during the genocide conducting interviews and doing research, Dr. Alex de Waal was in London compiling, editing and writing this article. “Evil Days: Thirty Years of War and Famine in Ethiopia,” Africa Watch (1991). Dr. Alex de Waal, principal investigator. “Sudan: Denying the Honor of Living,” Africa Watch (1989). Dr. Alex de Waal, principal investigator. de Waal, Alex. "What Happens if Mass Starvation Takes Hold in Yemen?" The New York Times, June 14, 2018.
de Waal, Alex. Beyond the Red Sea: A new driving force in the politics of the Horn. African Arguments, June 11, 2018.
de Waal, Alex. "We must never forget to remember". Irish Times, May 8, 2018.
de Waal, Alex. How can famines be ended? New Internationalist, April 1, 2018.
de Waal, Alex. "Politics of starvation: The decline in humanitarian effectiveness", Review of Famine in Somalia: Competing imperatives, collective failures, by Dan Maxwell Nisar Majid, January 30, 2018.
de Waal, Alex. Can Somalia Ever Win Against al-Shabab?, Foreign Policy, October 19, 2017.
de Waal,Alex. "Sisi Goes to Addis Ababa". The New York Times, January 26, 2015.
de Waal, Alex. “Evidence For The ‘New Variant Famine’ Hypothesis In Africa,” Justice Africa, (2006). Carr Center for Human Rights Policy and the Harvard University Committee on African Studies. 2014. Two Sudans: The Path Forward, Harvard, April 3, 2014.